PTSD REEVALUATION UPDATE 07: According to Anna Johnson, a doctoral candidate at the University of North Carolina, Chapel Hill, veterans exposed to combat have a higher long-term risk of heart attacks and strokes. Johnson found that, compared to non-veterans, combat veterans' 10-year risk of heart disease is more than 3 percentage points higher. She presented the findings at the American Heart Association (AHA) annual conference on Cardiovascular Disease, Epidemiology and Prevention, in Phoenix. In the study, Johnson and her colleagues followed nearly 5,000 men, including veterans who saw combat, veterans who didn't, and non-veterans who served as controls. "They came in for visits every few years," she said, "with about four visits each since the 1980s." Researchers looked at measures such as blood pressure, smoking, cholesterol levels and other factors to predict their heart disease risk over the next decade. The men started the study between 1987 and 1989, and the last follow-up questionnaires were conducted in 2001 and 2002. Johnson's team found that the mean predicted 10-year risk of heart disease risk was 10.2% for the non-veterans, 11.5% for the veterans not exposed to combat and 13.3% for those exposed to combat. She said, "While others have studied veterans and their risk of combat, nobody has looked at predicted risk. Many previous studies did not separate subjects who were in combat from those who were not and the follow-up time is longer than in most studies. Other studies have looked at shorter-term risk and found limited evidence for a higher risk of cardiovascular events." Johnson said deciphering how combat boosts heart risk was beyond the scope of her study. In a previous study, which Johnson presented last year at another AHA conference, she found that veterans of World War II, Korea and Vietnam who had seen combat were 60% more likely to be heavy drinkers than those who had not, and four times as likely to be problem drinkers than those who hadn't been in the armed forces at all. She also found that combat vets were 20% more likely to be heavy smokers than vets who hadn't seen combat and nearly two times as likely to smoke heavily compared with non-vets. Joseph Boscarino, a Vietnam veteran and senior investigator for the Giesinger Clinic in Danville PA has researched combat exposure and post-traumatic stress disorder (PTSD) for 30 years. He said this new study adds to the growing literature that combat is related to heart disease. But he added that based on his research, it was determined combat by itself is not significant when you control for PTSD in a study. PTSD is a psychiatric condition triggered by a life-threatening event such as military combat, disaster or serious accident. 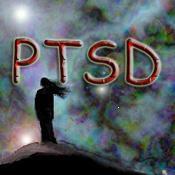 People with PTSD often suffer from nightmares, flashbacks and other persistent reminders of a past traumatic event. In other words, Boscarino said, "Combat by itself doesn't make you more at risk for heart disease, it is whether you develop PTSD. It appears that PTSD is a good predictor of heart disease risk." Anguish for ones that are hidden. Tattooed on the soul of a vet.